Skipper Andy Teague walks back to the dressing room after receiving a red card against Telford. Photo Josh Vosper. 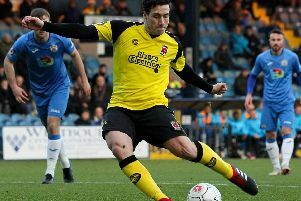 Chorley captain Andy Teague will still be able to lead the Magpies out at the LFA Challenge Trophy final at the Macron Stadium on Monday despite facing a three match ban. Teague was sent off for violent conduct after allegedly raising his hands to AFC Telford player Josh Wilson during Chorley’s 2-0 defeat on Saturday. But fortunately the suspension will only kick in on March 19 leaving him free to face his former club Lancaster City and potentially lift the trophy at the home of Championship club Bolton Wanderers. The referee also awarded a penalty for Teague’s apparent clash with Wilson but Chorley boss Matt Jansen says you should never raise your hands in football. He said: “In the first half an hour thought we were in control and causing them problems. “But in the last 10, 15 minutes (of the half) we made our own mistakes. “Dale Whitham gave the ball away in a dangerous area and they scored from it. “It was our own individual errors and then the sending off after gives you a mountain to climb. “Teaguey is saying that he has been clattered first but if you raise your hands you are always in danger of them seeing the wrong thing.